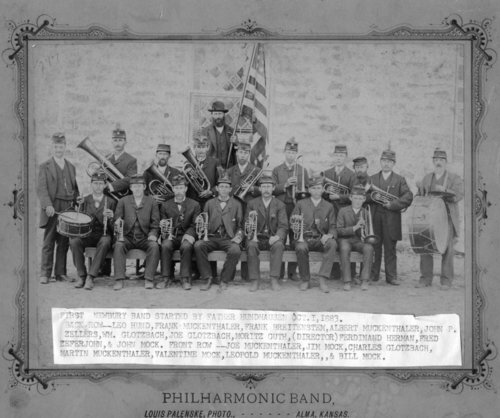 Photograph showing members of the philharmonic band from Newbury, Kansas, standing outside an unidentified building. The band was organized on October 1, 1883 by Father Hundhausen. Members are identified as (back row, left to right) Leo Hund, Frank Muckenthaler, Frank Breitenstem, Albert Muckenthaler, John P. Zellers, William Glotzbach, Joe Glotzbach, Moritz Guth, Ferdinand Herman (director), Fred Zeferjohn, and John Mock; (front row, left to right) Joe Muckenthaler, Jim Mock, Charles Glotzbach, Martin Muckenthaler, Valentine Mock, Leopold Muckenthaler, and Bill Mock.